Roman and Medieval periods: The Romans left some evidence of their presence in the area with a brooch (in DCM) and fragments of both Roman pottery roof tiles and blue tiles that may indicate a villa was formerly positioned south of Eggardon Hill. There is also a Roman-style culvert on the private road just west of North Eggardon Farm that may indicate that the Roman house at N Eggardon Farm was of unusually high status. There is no archaeology from the early medieval period before the Norman Conquest. The lands presumably belonged to Ordulph a nephew of King Aethelred and a man enormous strength, stature and wealth. He and his wife provided numerous manors presumably including that in Askerswell on the foundation of Tavistock Abbey in 981. The abbey is listed as tenant-in-chief of Askerswell in the Domesday Book (1086). It is recorded in that work as Oscherwille with 30 households. 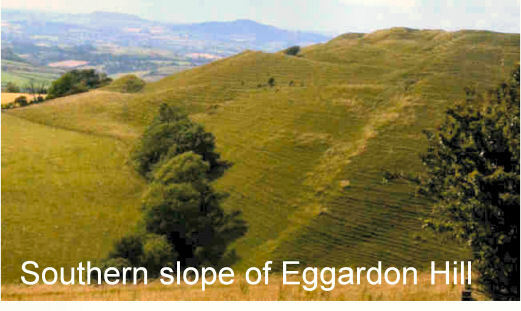 It was in Eggardon Hundred, formerly the larger division of a county than a Parish first recorded in the laws of King Edmund I (939-46). It was an area of sufficient land for 100 households raising about £100 per year in tax. Weymouth is where the Black Death first reached England in the summer of 1348. It reached Bridport later that year and it is certain that it killed people in Askerswell including its vicar.